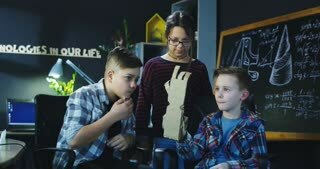 Group of content children creating carton prosthesis of arm with help of robotics. Static 4K shot on Red cinema camera. 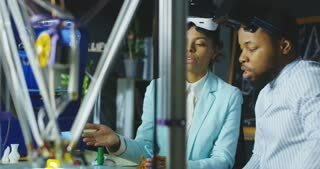 Group of black coworkers in laboratory wearing VR goggles and exploring 3d printing model and check quality of printed product. 4K movement shot on RED cinema camera. Young woman with class of children talking about 3d printed prosthesis of hand made of cardboard. Young woman with class of children talking about 3d printed prosthesis of hand made of cardboard. Movement 4K shot on Red cinema camera. 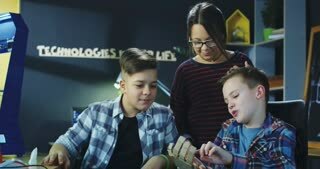 Group of content children creating carton prosthesis of arm with help of robotics. Movement 4K shot on Red cinema camera. 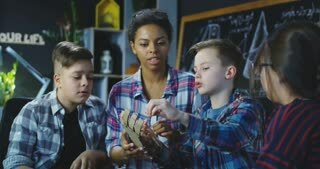 Group of content children creating cardboard prosthesis of arm with help of robotics. Movement 4K shot on Red cinema camera.